Last time you showed me how to recover my loved photos from iPad, and it worked really well. But this time, I encounter another plague: my Windows Vista keeps rebooting during startup. I have been fretful all day long because I urgently need to use my computer. I really appreciate it if you can help out. Thank you for your trust in us. Just like what we do all the time, we can feel your pain and we are able to offer the best solution to solve your problem that Windows Vista keeps rebooting. 1. Overheating. If there is improper air circulation and dirt sitting between the CPU and the fan, the CPU will get hot and your computer will automatically shut down. 2. Memory corruption or bad memory. Most of the causes seem to bring hopelessness to us, but don't feel down. In fact, as editors, we also sink into the same issue that our Windows Vista keeps restarting sometimes. And we have tried hundreds of ways to fix it. For your information, here we would like to introduce the best solution to you: try Windows Boot Genius. Windows Boot Genius is the all-in-one Windows boot repair software that can create a Windows boot CD to fix all Windows boot Issues, such as Vista rebooting issue, blue screen of death, black screen of death, freezing loading bar, random system corruption, etc. The followings are the instructions to show you how to use Windows Boot Genius to fix the issue when Vista keeps rebooting. 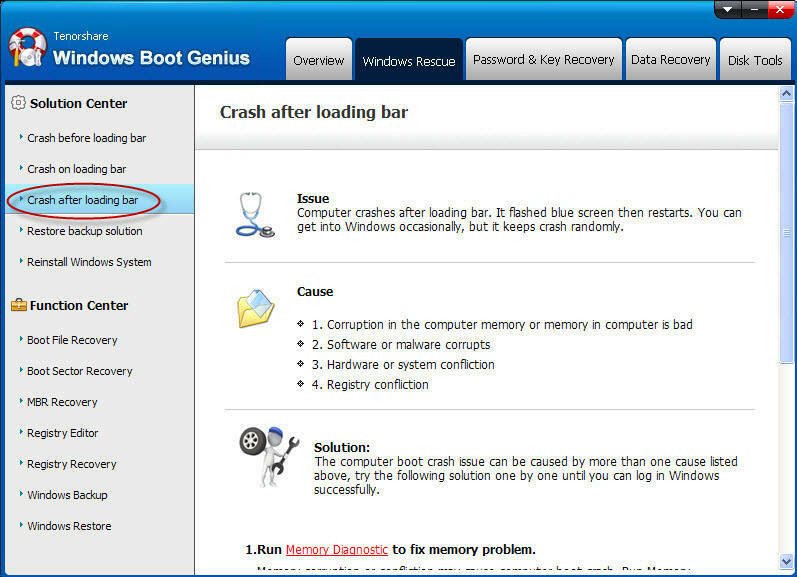 How to Use Windows Booting Genius to Fix Vista Rebooting Issue? Step 1 Download Windows Boot Genius and install it on any available computer. Step 2 Insert one blank CD/DVD or SUB drive to your device. Run Windows Boot Genius. Select CD/DVD or USB Flash drive in the main interface, and then click "Burn" button to begin boot disk creation. After you create the new boot disk, boot up your computer. Then you will see there are two parts in the interface of Windows Boot Genius: Solution Center and Function Center. In Solution Center, you can find the phenomena of your device boot issues and corresponding solutions one by one. In Function Center, all Windows boot repair tool are listed. Before you go to fix issue that Windows Vista keeps rebooting on its own, you are highly recommended to backup your operating system. This will help to get your operating system to the original state with the function of Windows Restore if you fail to repair Windows. Step 1 In the interface, choose "Windows Rescue" mode and select "Windows Backup" in the Function Center. And then click "Windows Backup" button. Step 2 In the pop up window, there are four buttons: System Backup, DPT Backup, MBR Backup, and Registry Backup. You can choose any of them to continue. For safety consideration, you are friendly suggested to backup all of them. Step 3 In the pop up window, there are three steps. First, select Windows Vista system as your target Windows operating system. Second, select an appropriate save path for the backup file. Then click "Backup" button. Step 1 After you have backed up your Windows Vista system, select "Crashed after loading bar" in the Solution Center, and then follow the solutions instructions to repair the Windows Vista rebooting issue. Step 2 In the main interface, the causes are listed. And you should try all the fix methods one by one until you enter Windows successfully: Memory Diagnostic, Microsoft System Restore, and Registry Recovery. Then follow the wizard to finish the issue that Vista keeps restarting. We guarantee that Windows Boot Genius is 100% workable to help you fix the Vista rebooting issue, since we got wonderful experience to use it to successfully solve our Windows problems for thousands of times. Why not try it now? Tips: If it is a physical problem, you should ask an expert technician to fix it or you can consult us.